Lady & West is a duo of Greenpointers Jennifer Billiot and Kirk Garrett. It is a beautiful artistic union that has produced a very good debut album called Bright Soul. I enjoy it and I enjoyed even more the chance to hear about the synergy of love and shared creative passion that led Jennifer and Kirk to make the album. Their story is an inspiration on many levels and they are yet another example of the interesting, kind people that call our wonderful neighborhood home. Let’s just get this out of the way first: Jennifer and Kirk are indeed a couple, but the last thing they want anyone to think is that their music is some sort of gimmick, or that their relationship is an angle they are emphasizing. I think that’s fair, and any art should be taken of its own merit. But what’s interesting to me is how it seems their connection enabled them to discover something far greater than each might have done on their own, as you’ll read. To me, it’s an incredible thing to be able to detect two distinctive personalities but also gain a sense of a combination that blurs the lines of the individuals. 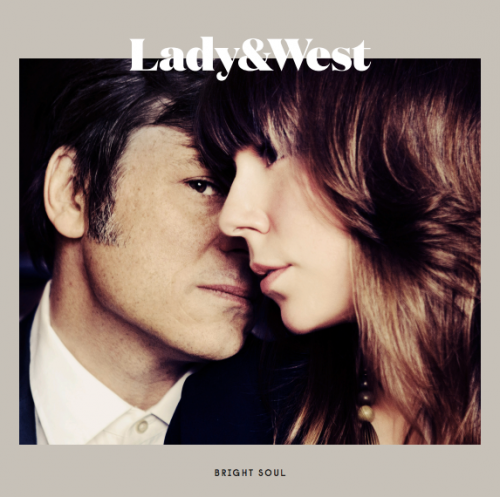 It’s there in the band name: Lady & West, emphasis on the &. And look at the album artwork. You can see two people, but you can also see two faces almost melding into one. I was very moved by their story of discovering their individual voices and what they could do once they started working together. The evolution of their relationship and their music are inextricably linked. I liken it to a gestation period, a natural developmental process that culminated in the birthing of something totally new. It all came from an honest, genuine place. But don’t take my word – or theirs, we discuss this below – for it. Listen to the music. You can’t help feeling like you are right there in the room as Jennifer sings and Kirk picks and strums. It doesn’t sound labored upon, its sounds effortless. Kirk’s guitar, usually acoustic, carries an elemental vibe. It’s sometimes percussive, often a complementary voice of melody to Jennifer’s actual voice. The music evokes folk, country, blues, and rock and roll. There is plenty of earthen, organic imagery to go along with sonic backdrop. Jennifer’s voice reminds me of Jenny Lewis, with its clarity, soul, and occasional ache. She inhabits a first person narrative well, but is just as comfortable in the 3rd person, like on “Rest Your Soul.” Many of her words have a literary quality, like the mention of Rimbaud in “Newfoundland,” or the even more direct evocation of Edgar Allen Poe on “The Raven.” “Mojave” kicks off the album with a more upbeat, rhythmic energy, and “Bright Soul” closes it with an entirely different soulfulness. I still haven’t puzzled out exactly what “Geraldine” means, but I do know it transfixes me every time, and I love all the metaphors on “If I Were A River.” Songs like “Wyoming,” “Everything,” and “Beyond the Lines,” find a deep poignancy in pondering distance and connection, whether physical, in time, or between people. Ten great songs here, people. You can listen on Soundcloud or better yet, purchase on iTunes. Check out the band’s website here, as well as their Facebook. Keep on eye on both for news about upcoming shows as well as videos. They will release footage from their album release show in the near future and are sure to be playing some dates this summer. And now, the interview. I met Jennifer and Kirk at Achilles Heel, and we had a great discussion. I had to cut it down, but it should give you the same feelings I got talking with them. Namely, they are warm and thoughtful, they are passionate about music, creativity, and each other, they love Greenpoint, and more. GP: Let’s start back with how you met and began with the music. Jennifer Billiot: We met in advertising. We’re a couple, yes, but I feel like we’re artists first together. I mean we were together for probably seven years before we started working on this album, before we started making music together. So this is sort of a recent thing. Kirk always played guitar and he gave me a guitar for Christmas pretty early on in our relationship. I wanted to just learn old country songs and have a reason to sing. We eventually started playing together, doing covers. We weren’t writing together. Kirk Garrett: Can I give my version of the beginning? We met and became really good friends, and she likes tons of music. And I like tons of music. And so all we did was talk about music. She showed music that I didn’t know. And then I showed her music that she didn’t know. When we worked together, we would go to pubs. We worked by Second Avenue in Midtown and we’d go to Irish pubs with all of our friends, great people. And there would be a jukebox, and she and I would be over standing by the jukebox together. JB: We’d be stuck on it for hours. KG: Pouring money into it. Dancing together. GP: Music was always part of the connection? KG: Yeah, like a collision of enthusiasm. JB: Our first date I guess, was he came over and stayed until 4 in the morning because we were doing that, “Yeah, listen to this.” We would sit there and listen to the whole song and then go to another one, go to another one. JB: And then he fell in love (laughs). JB: I think we felt “Oh my god, I have someone that gets it too.” You know? And is turned on by this. KG: It was almost like a mutual music education, as well as all the other things that we loved too. But music was the center of it. Turning each other onto music. JB: Kirk reintroduced me to Emmylou Harris. I’d heard her before, but this time it wrecked me, it was this revelation. And he got me into Neil Young, who represents so much that is important to me, to us, when we create. We think of ourselves, I think, without being highfalutin about it, we think of ourselves as artists first and musicians second. We have done other stuff that’s not music and I think we could still do other stuff because we love collaborating, we love making stuff together. We always like to make stuff. It’s fun. That’s all. It happens to be music and music’s what we have the most vocabulary. JB: That’s where my heart is, but I agree with you. KG: Our experience is that we have a synergy that when we get together there’s a chemistry. And that’s really the crux of what keeps us going. JB: I think there’s an “and” in our name for a reason. I think Lady and West represents all kinds of different things but the point is when you put two individual things together that have a chemistry or an alchemy, that is where the magic is. When we play live, something about when he starts playing, I feel like I can do anything. Before that, it’s terrifying. But if he’s up there and I hear what he’s playing, I just feel like we’re… what am I trying to say? It’s nothing without each other. And also, I have to say our friends were very encouraging to help this project get going. KG: We’re right now very emotional because we love our friends so much. We have all these people doing stuff and we all support each other, so it’s a community. And we all have fun. We’re all hard workers. Anyways, we would write a song and we would post it on bandcamp just like you’re releasing singles, only your audience is 12 big enthusiastic people. We’d post it and she would write everyone and text everyone, it would be out there. And you walk into their place and they’re playing it. That enthusiasm and love just makes you so happy. JB: It gave us the belief that we should do this. KG: Then pretty soon you got 12 songs and they’re all up and you’re like “Wow.” We had a lot of stuff up and it was fun. But that became our demos. GP: I thought the story in the Kickstarter video about your very first writing experience together, for the song “Rest Your Soul” was really interesting. Could you talk more about that? JB: I mean, for me it was profound. It was an experience where you’re a bit outside of yourself, you’re being taken, it’s spiritual. There’s a relinquishing of self-consciousness. It’s a high, it’s a really beautiful experience. You both are on some elevated plane together. And it’s not flawless, it’s not like “And there it is!” But Bert Jansch just says it in one of the many documentaries that the good ones are written really fast, you know? They just come out. It happened very fast and it was there. One of my favorite things about songwriting and creating anything is the feeling after it’s done that that thing didn’t exist before and now it does forever. It’s a thrill. It’s this entity, it has a life. It has a heartbeat, it has a soul. It affects people. It didn’t exist. And now it does. It sounds really obvious but it’s such a beautiful thing. It was a watershed moment for me. It was a turning point when we were going through that together for the first time, since it was our first song, I knew immediately “Something has happened.” I knew things will never be the same – I’m going to start crying – after this moment. I knew. There’s something real happening and it will never be the same. KG: Another important one is the second song on the album, “If I Were A River.” That one we wrote on your balcony in 10 or 15 minutes from beginning to end. And loved it, we were just so happy to have done that. JB: You were playing guitar, I was inside. Screen door was open so you could hear the record I was listening to, a beautiful 60s folk compilation we found on the street in the neighborhood. Ancient folk music. And this haunting, heart-wrenching, pure, woman’s voice, just her and the guitar, comes on and it just struck me, killed me. That woman just came to me, and something just came out. I went outside and you were fooling around with the guitar, it just went bam, again. JB: And that’s the beauty, when that happens. When you start playing, my head goes, you turn something on inside my brain. KG: I think that style of guitar and the style of your lyrics, all of it kind of blended into what we felt was finally our voice, which happened more on that song than any other. We’d written “Rest Your Soul,” but I think because of this picking style on the guitar, that thing we did which taps into this folky country blues thing, that got us going. So the next six songs we wrote were in that world. I think the only time we did have pressure was with “Mojave.” It was the last song on the album recorded because when we arrived in Austin, it wasn’t remotely finished. We did finished that the day we recorded it. JB: When you’re recording you have time to shower, eat, sleep, that’s it. You start in the morning and you finish late at night and you’re exhausted. There was a little of “When is this going to happen?” But we weren’t really stressing cause we were there – there as in the spiritual sense – and we knew it was going come out eventually. And that’s the thing, you wait, you let it happen. You don’t force it. When you force it, you can hear it immediately. It’s just not the truth. I think that’s the case for anything. So the only night we went out to dinner, we go out for Mexican food. It’s pretty empty. We can hear the table next to us. And the guy goes, “Oh I love Joshua Tree, the Mojave desert is just amazing.” We’re in Austin. I’m like, people know Joshua Tree, but they don’t know it’s the Mojave desert. It’s not like we were in California. I couldn’t believe that we heard that. The next morning, I woke up with the chorus. Like in that kind of not quite awake, not quite asleep mode. It was like 6 in the morning. Woke up, it came. Knew. Woke him up. Sang it. He picked up his guitar and finished it. To have that affirmation the night before was beautiful. Very cool. GP: It’s like everything feeds off itself. JB: I have another story like that I want to tell you. I read Just Kids like everyone else in the world by Patti Smith. I had an issue calling myself an artist, but in reading Just Kids and her perspective on what an artist is and her artistic approach to life, I completely vibed with. She essentially gave me the permission I needed to call myself an artist. That happened right before we wrote “Rest Your Soul.” I know they’re all connected. Flash forward to this January. We finished our album January 5th. A few days later we had tickets to see Neil Young at Carnegie Hall. I’m seeing my hero, acoustic. That would have been enough. Such a gift already. But just before the show, we go get a shot of whiskey and on the way back to our seats, Kirk is like “There she is.” Patti Smith. I had just taken that shot of whisky, so I’m sure that helped, but it didn’t matter. I just dove in. Like “Patti Smith, I’m Jennifer Billot.” I gave her my hand, she takes my hand, never lets go. She was what you would hope for knowing who she is outside of herself. She’s completely warm, completely open, eye contact the whole time. And kind of looking at me like “I should know you.” Cause I was so not nervous. JB: Talk about ultimate affirmation. I mean full circle. I remember the whole conversation. It was quick obviously. “I’m Jennifer Billot” And then I said – this was not rehearsed or anything, just what came out, “You live across from our best friends’ restaurant.” And I go “I always wanted to tell you if I saw you, you gave me the permission I needed to call myself an artist.” I had a few chances to meet her at the restaurant actually but I didn’t want to force it then. Anyways, she goes “Oh, honey, you would’ve gotten there anyway.” So then we leave, sit down, lights go down, Neil Young starts and I just start bawling (laughs). GP: Wow, that’s a great story. That’s really cool. How about we close with some of our favorite things about Greenpoint? KG: I like the Polish heritage. Karczma, that’s a cool place. I like the soul of this area, the interesting people with this great language. I like the physicality, I like the location. It’s kind of open, there’s lot of light, it’s beautiful. I love all the little small businesses around here. Like Dandelion Wine. I love how authentic and how in love and passionate with their business that these folks are. JB: I’ve never had a bad bottle, ever. KG: We like that Wolves Within boutique, we like a lot of the small businesses around here. JB: I’ve lived in the Lower East Side for a couple years, I lived in Williamsburg for a couple of years. The apartment that I’m now in here is the first place where I felt home. I love living in New York but it didn’t feel like home until Greenpoint. And at a visceral level, it was immediate. There’s a friendliness here, there’s a desire to get to know each other, which I think is unique in New York. There’s so much character in the small businesses, the boutiques, the restaurants, the bars. We’ve gotten to know all the people that work there and the owners and you’re happy to see each other. KG: Being near the water is great. I like the churches. I love the old churches. Stanislaus over there by McGolrick Park. St. John’s. The Episcopalian Church, St. Paul’s or whatever it is. There are some very beautiful churches. Very beautiful. What is it, St. Anthony’s? The big Catholic spire. Those are beautiful. No one’s ever going to build those in the future. JB: I love Chopin, the pharmacy. You don’t feel like you’re in sick. And we love Le Gamin. KG: There’s a sense of community. Also, there’s a lot of new stuff coming in, that juxtaposition, that co-existence, is really, really great. Love that. Keeping the old, something continuous, and the integrity of that without screwing it up, but totally bringing out the new things too. JB: I think we all know that we’ve got something good. There’s this understanding like “Yeah, we found it.” This is kind of cheesy but in a way it’s like saving the best for last, cause we’re way up here, we’re almost to Queens. But I like that. There’s a pride here. Stephen does economic development for North Brooklyn businesses and writes about music at the online site Those Who Dig. He's only ever lived in Greenpoint while in NYC and he hopes it stays that way.